The US has defended comedian Jay Leno's right to free speech after India condemned a reference he made to the holiest Sikh shrine. A Leno skit showed the Golden Temple of Amritsar as the summer home of Republican candidate Mitt Romney. Mr Romney has faced questions over his wealth and many Sikhs are angry the temple has been depicted as a place for the rich. The Sikh community has launched an online petition over the comment. An Indian minister called Leno's comments "objectionable" and said "freedom does not mean hurting the sentiments of others". State department spokeswoman Victoria Nuland said the US had not communicated with India on the issue but that the US Constitution strictly protected freedom of speech. "I hope [Leno will] be appreciative if we make the point that his comments are constitutionally protected in the United States under free speech and, frankly, they appeared to be satirical in nature," Ms Nuland told reporters. She said the US had "absolute respect" for all Indians, including Sikhs, and that President Barack Obama was the first president to celebrate the birthday of the religion's founder, Guru Nanak, at the White House. "Our view is obviously that Sikh Americans have contributed greatly to the United States," she said. Overseas Indian Affairs Minister Vayalar Ravi had earlier said: "It is quite unfortunate and quite objectionable that such a comment has been made after showing the Golden Temple." The online petition, organised by members of the US Sikh community, accused Leno of making derogatory comments about Sikhs in the past. 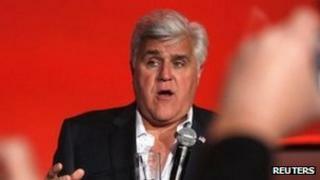 Jay Leno has not yet commented on the matter.